The Filmmedarbejderforeningen (National Association of Film Critics) of Denmark presented their 65th Bodil-prisen (Bodil Awards) tonight at the Bremen Theatre in Copenhagen. The event was hosted by Ditte Hansen and Louise Mieritz. The awards are named in honour of two of the most important actresses in Danish cinema, Bodil Kjer and Bodil Ipsen and are among the oldest film awards in Europe. Lars von Trier's poetic Melancholia was named Best Danish Film. This is von Trier's second win in a row after having won last year for Antichrist. Melancholia had led the field with six nominations. It didn't pick up any of its five acting nominations. However, its cinematographer Manuel Alberto Claro was named the year's best. Dirch (A Funny Man) by Martin P. Zandvliet ended up with the most awards. 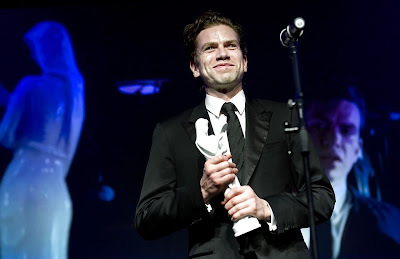 It won Best Actor (Nikolaj Lie Kaas) and Supporting Actor (Lars Ranthe), as well as two newly introduced awards, the Henning Bahs Prize for Art Direction (Charlotte Bay Garnov and Peter Grant) and the Blockbuster Audience Award. The Best Actress prize went to Lena Maria Christensen for En familie (A Family). Paprika Steen claimed the Supporting Actress honours for SuperClásico. The winner for Best American film was Debra Granik's Winter's Bone. She has been up against local favourite Danish director Nicolas Winding Refn's Drive. The winner for Non-American Film was Oscar-winner Jodaeiye Nader az Simin (A Separation) by Asghar Farhadi. Christian Sønderby's Testamentet (The Will) was crowned Best Documentary. A Special Bodil was presented to distributor Jes Graversen at Miracle Films. The Honourary Bodil for lifetime achievement went to actress Ghita Nørby who has over 110 film credits.